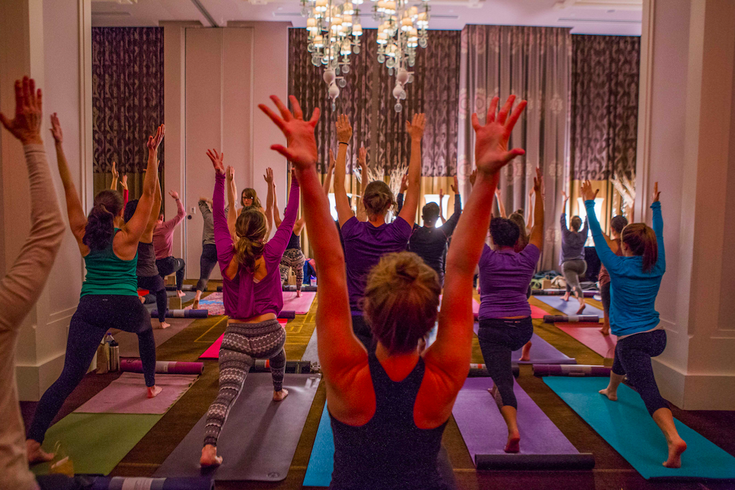 Three Queens Yoga class at Hotel Monaco. Old City's Hotel Monaco will host a one-day-only fitness and wellness expo on June 26. The summer expo is similar to the hotel's January Resolution Rx event. Local studios will offer classes for $7 each and, after working out, there will be healthy snacks and massages. Three Queens Yoga, Joltin' Jabs Boxing Fitness, Allongée barre, Charge Performance and Wellness and City Fitness will all offer classes at the expo. All classes are 45-minutes long. Yogis, bring your own mat. Tickets to the classes must be purchased online; no tickets will be sold at the door. Food from Snap Kitchen and fresh juices from Satya will be available to attendees after each class, along with hand massages and makeup touch-ups from Rescue Spa. All proceeds from the event benefit Back on My Feet, which uses running to help those that are currently homeless. The program aims to transform the way individuals see themselves, in order to make real changes in their lives.